The attached map shows the outline of the Adirondack Park in blue because that is the traditional color dating back to the original line drawn in 1885 when the forest preserves in both the Adirondacks and Catskills were created. The lands within these preserves that are owned by the State of New York were declared to be “Forever Wild” in Article 14 of the New York State Constitution. The lands are fiercely guarded and while it only takes a simple majority to add land to the preserves, any attempt to reduce the holdings must be passed by majorities in two successive legislative sessions. One of the interesting things about these lands is that there are private lands as well as public lands within the preserves and the regulation of these private lands is sometimes very controversial. A separate agency called the “Adirondack Park Agency” (APA) is in control of these lands. This link will take you to additional history on the creation of the Adirondack Park from the Adirondack Park Agency as well as numerous other links about the regulation of the area. While the link above is more regulatory, an historical article with pictures of the original maps of both the Adirondack and Catskill Parks is available from the Department of Environmental Conservation (DEC). It’s just a short piece, but summarizes nicely and contains many additional links to other DEC writing and off-site information. There are also interesting pictures of the types of surveying equipment used. 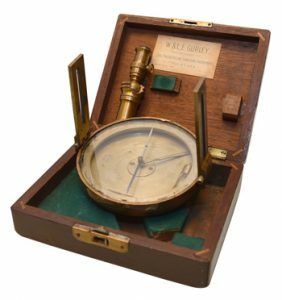 I particularly like the “pocket compass”. My how things have changed! Finally, to play with a live version of the map excerpt at the beginning of this post, head on over to New York State’s Blue Line map on ArcGIS. Here you can drill in or zoom out and get whatever level of detail is of interest to you. As you drill in, new layers and details become visible which adds to the interactive experience. And for the true map lover the APA has a web page full of links to additional maps and GIS data. Have at it!